Scheduling was developed as a scientific computer based modelling process at a time when ‘command and control’ was the dominant management paradigm supported by the ideas of ‘scientific management’. The artefacts created by schedulers generated the impression that the mathematical certainties calculated by their leading edge computer tools somehow translated into certain project outcomes. Knowledge workers cannot be effectively managed using ‘command and control’ paradigms. 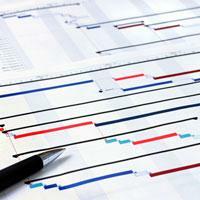 The ‘art’ of effective scheduling has largely disappeared from the project landscape. Uncertainty and complexity are starting to take centre stage. In response to these challenges, one approach has been to build ever greater sophistication into the basic CPM modelling process in an attempt to achieve certainty (or at least quantify the uncertainty). The problem with these approaches lays in the uniqueness of each project. To take one example, Monte Carlo analysis can be used to develop an appreciation of the degree of uncertainty in a project. However, the basic assumption underlying the methodology is the presumption of a predictable distribution for the duration of a task (Triangular, Beta, Normal, etc) and as a consequence, the range of outcomes for whole project may be assessed with a degree of certainty. This fundamental assumption is based on a false premise. The ideas of a normal (Gaussian) distribution and the calculation of a standard deviation were based on measuring hundreds of similar events and the ‘standard deviation’ defines the degree of error within the data set; not the accuracy of ‘a single estimate’. A project is not part of a large ‘data set’; it is by definition a unique entity. Similar issues arise with adding additional layers of detail and complexity to the CPM model; the ‘extras’ do not prima facie improve the value of the CPM model. More detail about a future job of work that is currently undefined simply adds ‘noise’ the information is no more accurate than a summary task but all of the noise created by dozens, if not 100s of inaccurate guesses about thing that may or may not happen in the future can quickly obscure any meaningful information. A radically different approach is needed to make scheduling relevant and useful in the 21st Century. Starting with the ideas derived from Complexity Theory, Complex Responsive Processes of Relating (CRPR) and the concept of the project team as a ‘Temporary Knowledge Organization (TKO) one can see the delivery of the project being crafted by thousands of individual decisions and actions taken by people who are ‘actors’ within the social network of the project team and its immediate surrounds. It is impossible to ‘control’ these thousands of individual thought processes! The role of effective project management is to motivate, coordinate and lead the team towards the common objective of a successful project outcome. To achieve real success, the team members need to understand and embrace the project’s objectives as their own and then work effectively towards their achievement. In this environment the project schedule has two key roles to play, firstly as a tool to develop a common understanding of the optimum approach for achieving the project objectives and then as a flexible tool to measure the inevitable deviations from the plan and re-assess the best way forward. The rich symbolic language of a well constructed CPM is a far more effective way to communicate the complex ideas of timing, sequence and dependencies than words, provided the ‘project actors’ understand the value of the message and its limitations. This means developing schedules that are simple, elegant and effective communication tools. Remember, effective communication requires sending messages that are received, understood and where appropriate, acted upon by the receiver. This is a two-way process, at the very least for a communication to be complete, the sender needs to know the message has been received and understood. Communicating effectively with schedule users (your stakeholders) is as much an art as a science. It starts with understanding who the important stakeholders are, the ones you must invest a greater communication effort in. Standard reports can be used for the rest. Then it is about determining the reason you need to communicate with the person and designing a communication strategy to achieve your desired outcome. Finally, as the communication strategy is implemented, processes need to be in place to measure the effectiveness of the communication and make sure it is working effectively. Communicating effectively in the age of complexity will require many project schedulers to significantly expand their existing skill set. Schedule reports need to be simple and focused on the needs of the receiver. Time needs to be taken to make sure the schedule is understood and agreed by the key stakeholders. Follow up is needed to see what actually happened and to understand variances. The schedule then needs to be updated and adapted to keep it relevant and useful before the next round of communication starts. If the schedule is not relevant and accurate it won’t be believed and used by the project workforce. And if it is not used to help optimise the delivery of the project, there is absolutely no point in wasting time and money developing a document that is at best a measure of failure. Project controls don’t control anything, but effective schedules can influence future behaviours to the betterment of the overall project if they are well designed, useful and actually used! Useful schedules are useful because they are used!